When archaeologists discovered the first ever Etruscan pyramid-like buildings under a city in Italy, they were at a loss to explain the mysterious structures. Three years ago a team of U.S. and Italian archaeologists began excavations under a wine cellar in Orvieto, Italy, after identifying stairs carved into a wall as Etruscan style. As they dug through mid-20th century and medieval walls and floors, they encountered tunnels and caves. These large chamber walls were carved to slope up in a pyramidal shape. Etruscan Pyramid columbarium, used as a working lab, and filled with artifacts. Credit: Daniel George, Jr./Popular Archaeology. 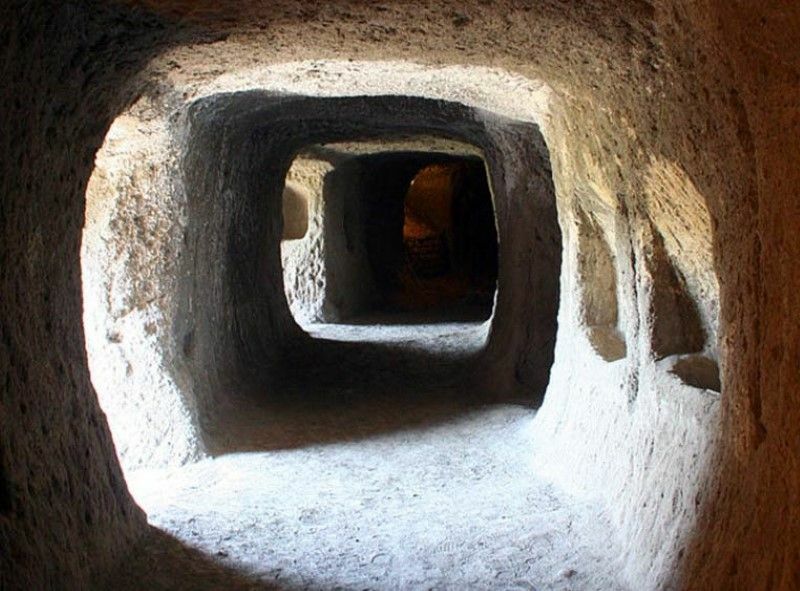 The Etruscans created and shaped many subterranean paths and cave chambers, but until this discovery none had ever been found that were in such a distinctive form, with a narrow apex that slopes and widens into a square base. Archaeology team excavates the Etruscan ‘Pyramids’. Credit: Daniel George, Jr./Popular Archaeology. Etruscan are largely an historical enigma, emerging as a sophisticated culture around 900 BC in central Italy, and bringing art, fine metalworking, commerce, and writing to Europe and the Mediterranean. However, the society did not survive, and they were blended into the Roman empire, leaving few clues as to their culture. A medieval chamber for raising pigeons, called a columbarium, filled with excavated pottery. Credit: Daniel George, Jr./Popular Archaeology. Excavations on the cavitá and related sites have produced ceramic materials, large basins, Attic red figure pottery, and more. In all, Claudio Bizzarri believes at least five similar pyramids exist beneath the city.